Okay, the photograph isn't that great, but look at those colors! The bug is a seed bug (Oncopeltus sanguiniolentus). The plant is Boothill eupatorium (Eupatorium greggii), also called Texas mist flower or Greg's mist flower. The mist flower is a favorite of queen butterflies. Striking! I wonder if it's poisonous? 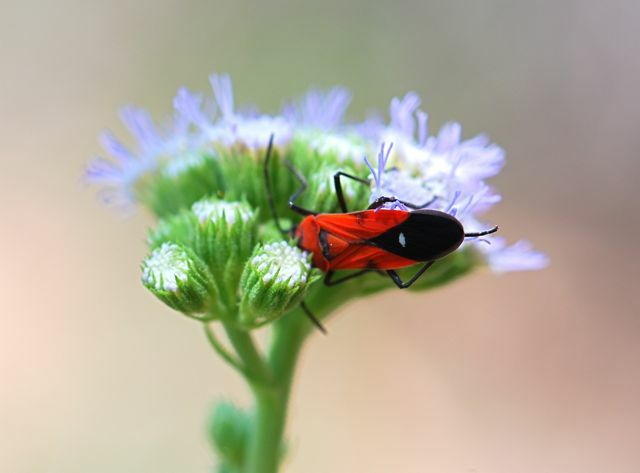 These bugs typically have defensive chemicals.